The current issue of The New Yorker has another interesting article by Atul Gawande, a surgeon and a faculty member with the Harvard Medical School. One theme of his writing has been the use of different strategies for improving professional performance. The Checklist Manifesto described how a well-designed checklist can improve outcomes in many different contexts, for example, and the unfortunate reluctance of many professionals to use them. In his current article, Personal Best, Gawande turns his attention to coaching as a means for improving professional performance. After eight years as a surgeon and thousands of surgeries, Gawande felt that he had reached a plateau. He was good, but he was not learning or improving. After receiving an offhand coaching tip from an inexperienced tennis pro that significantly improved his serve, Gawande reflected on whether coaching might similarly improve his surgical skills. He asked a former professor if he would be interested in observing his surgery and being a coach. 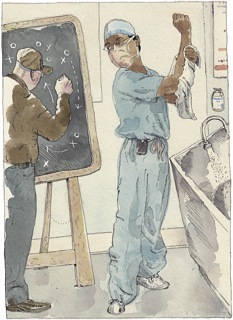 The coaching sessions included careful observation and resulted in specific suggestions that made Gawande a better surgeon. Gawande contrasts two perspectives on professionalism. One held by many professionals, including doctors, is that their expertise is an evolving condition (knowledge about disease and treatment) that they must build and sustain for themselves. Another held by many professional performers, including pro athletes and accomplished musicians, is that “no matter how well prepared people are in their formative years, few can achieve and maintain their best performance on their own.” Itzhak Perlman and Renee Fleming describe the importance of their “outside ears, and eyes” in achieving their level of professional excellence. Always careful not to claim too much based on anecdotal evidence rather than careful research, Gawande uses engaging examples and still manages to be provocative. He describes a fascinating study involving teachers. It showed that teaching workshops led teachers to use new skills in the classroom just ten per cent of the time. Only twenty per cent made the changes when a practice session was added with demonstrations and personal feedback. But “when a colleague watched them try the news skills in their own classroom and provided suggestions−adoption rates passed ninety per cent.” This study made me feel good about deciding to ask Peg Carlson to provide more coaching on communication skills for people at the School who might be interested (more about that later). I hope you will read this article and think about how we might use coaching to become even more effective in our work at the School. Teaching is the kind of skill that might be improved by careful coaching. We appoint teaching mentors for new faculty members, but Gawande’s experience suggests it may be just as important for their senior colleagues. Coaches “observe, they judge, and they guide.” Find someone who is willing to help you get better by observing you, pointing out your weaknesses, and suggesting improvements. It requires opening yourself up to constructive criticism, which is not easy for most accomplished professionals. Could coaching help in areas of our work other than teaching? I had already explored the idea of getting a coach to improve my performance, and this article has convinced me that it could be worthwhile. I wonder if we could improve the performance of clients in some areas of their work by helping them to become coaches for their colleagues and their peers? I hope you will read this article and let me know what you think about it.